High Fructose Corn Syrup- Nectar of the Gods of pure Evil? It seems that every couple years, our society finds a new food, which is then blamed for all ailments and natural disasters alike. In the 80s it was dietary fats, then Dr. Atkins rolled around and carbs became evil. Lately, trans fats were pretty much outlawed, red meat will kill you after one bite and now high fructose corn syrup is under fire. So I figured lets take a look as to what it is and what it isn’t and draw conclusions from there. HFCS is a liquid fructose-glucose mix, which is used as a sweetener in foods and soft drinks since the 70s, since it is more stable and cheaper than cane sugar. 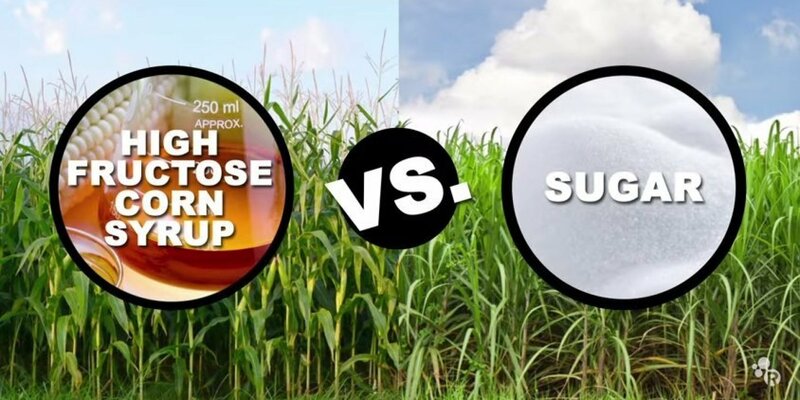 It is not much different in terms of composition from sucrose (table sugar) or honey. Basically, its a 45/55% mix of fructose and glucose, two simple sugars. Again, like table sugar or honey (which, in all fairness, contains enzymes and vitamins that other sugars do not). Honey 49% Fructose 43% Glucose. Yet, for some reason, HFCS ) is being blamed for all the issues that are plaguing the US, namely obesity, diabetes and cancer. Where this comes from I am somewhat uncertain, but I am guessing that it starting with the ” Fruit is evil” movement. While it is true that fructose, when consumed in large amounts, can cause gastric distress, it wont destroy your physique all at once. Another erroneous belief regarding HFCS is that it can’t be properly metabolized in the body and turns into some evil component once in your system, which then will make all your muscles fall off. This is simply not true, HFCS is pretty much digested like table sugar and is equally sweet while containing the same amount of calories ( 4.1 per gram). So what makes America obese? You might have guessed it: over-consumption. Daily calorie intake rose by 500 calories from 1980 till 2000, while activity levels dropped. Foods containing HFCS (or any other sugar) are easily over consumed. 80 oz soda anyone???? In fact, due to regulation and an overall hysteria regarding HFCS, less HFCS is being used, yet America keeps getting fatter. It’s a classical example, where the baby is being thrown out with the bath water. In a calorie-controlled environment, HFCS will not do any damage to your diet. Yes, calories matter, they matter more than anything else when it comes to losing weight. HFCS is not an evil substance in itself, it will not turn you into a cancer ridden diabetic just like eating goji berries won’t make you MR. Olympia either. I think one concept, that has gotten lost is the one of personal responsibility (one of the duties of a personal trainer is to be the nagging voice at times). Nobody can beat the laws of thermodynamics, if you take in more calories than you use on a day to day basis, you ll gain weight. People tend to develop OCD like behavior over small details such as pomegranate juice or acai berry for my anti-oxidants while forgetting to keep a food log. This is what is called the dieters paradox: despite rising diet consciousness and more and more healthy food choices being available, America keeps getting fatter. How’s that possible? Because most dieters do not equate healthy or “organic ” foods with calories and simply eat too much of them. Guess what? If your basic metabolic rate is 2000 calories and you are consuming 3000 calories worth of precious organic food, you ll gain weight. IF you eat 1500 calories worth of gummy bears, you ll lose weight ( coming soon: the gummy bear diet). Now please note, I did not say that you should eat only gummy bears to get into shreddedtown but you need to cut calories. Simply cutting out some supposedly evil food wont do it. All this obsessing over tiny details and joining the frenzy du jour probably causes a greater release of cortisol and thereby more harm than HFCS ever could. So, relax, eat your chicken and do your squats. Previous post: TEF- I can eat more and still lose weight??? Next post: Why do muscle gains slow down over time and how can we speed it back up?